A danger from the “war on terror” was always that it would encourage the spread of an authoritarian U.S. state, ignoring international law abroad and constitutional rights at home, a process that is now growing more apparent with impunity for both torturers and police who kill minorities. The international fallout from last week’s long-delayed release of the Senate Intelligence Committee’s 500-page executive summary of its still-classified 6,000 report on CIA torture could hardly be more intense, with calls coming from the United Nations, foreign governments and the human rights community for prosecutions of those who carried out or authorized the torture techniques described in the report, including senior officials from the Bush administration. But judging from the self-assured comments of CIA and former administration officials, there is no real concern over the possibility of any criminal liability, a lack of accountability which has led to a palpable arrogance among those who would be behind bars if laws were actually enforced on an equal basis in the United States. 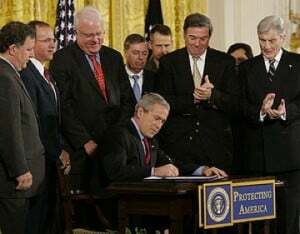 President George W. Bush signing Military Commissions Act of 2006. Short of this rather high bar, nothing, by definition, that the United States does to its detainees could conceivably be considered torture. “I’m more concerned with bad guys who got out and released than I am with a few that, in fact, were innocent,” he said. Taken to its logical conclusion, Cheney’s reasoning would seem to hold that it is preferable to indefinitely detain and torture a million innocent people than to allow one “bad guy” to slip through the cracks. The implications of this logic are, needless to say, chilling (not to mention completely at odds with the legal principle of presumed innocence). At times, watching Cheney make these cold rationalizations on “Meet the Press,” it may have occurred to viewers that the more appropriate venue for this interview would have been on the witness stand of a courtroom. After all, what Cheney was defending was not just controversial policy choices, but clearly defined crimes of torture and murder. Although he was sure to emphasize that “All of the techniques that were authorized by the President were, in effect, blessed by the Justice Department,” the fact remains that providing the cover of law to a crime makes it no less of a crime. Judging from Cheney’s arrogant display on “Meet the Press,” however, there appears to be very little appreciation for the niceties of international law such as its expressed prohibition on official immunity when it comes to the crime of torture. He seems to be quite confident, indeed, that official immunity is unnecessary when there is an implied unofficial immunity that is granted to public officials in the United States, this being the case whether it pertains to CIA torture or police brutality. The same arrogance that Cheney is so casually displaying can also be seen in the closely paralleled story of the recent spate of police shootings and killings of innocent or unarmed African-Americans, and the remarkable wave of demonstrations that has taken hold across the United States in response. 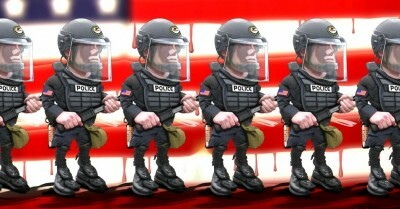 With large-scale protests happening in most major American cities over the past month – particularly since grand juries decided not to indict the police officers who killed Michael Brown in Ferguson, Missouri, and Eric Garner in New York City – one might think that cops would be extra careful these days not to come across overly arrogant or obdurate. This, however, would not be the case. In response to the NFL’s Cleveland Browns’ wide receiver Andrew Hawkins taking the field on Sunday wearing a T-shirt protesting recent police shootings in Ohio – reading “Justice for Tamir Rice and John Crawford” on the front and “The Real Battle for Ohio” on the back – Jeff Follmer, president of the Cleveland police union, claimed the shirt was disrespectful and he disparaged the very idea of athletes holding opinions about anything other than sports. “It’s pretty pathetic when athletes think they know the law,” Follmer said in a statement. “They should stick to what they know best on the field.” In other words, keep your opinions to yourself, boy, and just play football. Follmer also demanded an apology from the Clevelend Browns organization, which to their credit, the Browns did not extend. His six-minute locker-room monologue to reporters ended with him choking up while drawing a parallel between his own young son and the tragic death of Tamir Rice, the 12-year-old boy shot by police in Cleveland on Nov. 22 while holding a toy gun. “My number one reason for wearing the T-shirt was the thought of what happened to Tamir Rice happening to my little Austin. And that scares the living hell out of me,” he said. This threat to liberties is compounded when the justice system fails to hold accountable those who break the law and violate people’s rights. Whether it is Eric Garner in New York or Gul Rahman in Afghanistan, the victims of injustice must have redress, and “those who do wrong should get their due punishment,” in the words of Cleveland Browns wide receiver Andrew Hawkins. As human rights advocates and civil libertarians have warned since the early days of the “war on terror,” human rights violations of terror suspects will eventually set the United States on a slippery slope in which authorities deem it optional whether to respect the human rights of anyone, including U.S. citizens. At that point, anyone is fair game, and all of us, including law-abiding Americans, may find ourselves at the mercy of an unsympathetic authoritarian state.